It looks like the stock market is giving us some buying opportunities this month. While our net worth took a dip, we hit our savings and spending goals, so I feel proud of our progress this month. February was a month of full-on winter antics in New Hampshire. Our time in Santiago, just a month before, seemed like a dream, an impossibility! Our lives were cold and snowy this month. We enjoyed a bit of skiing, one week of winter break where we all got sick several times, and of course the Winter Olympics! 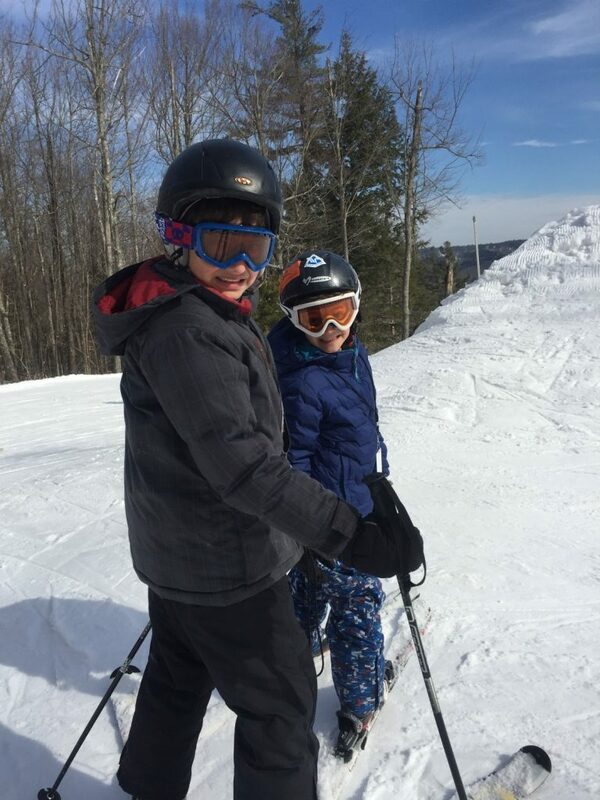 The boys and I enjoyed a few outings at our local ski slope in February, but not as many as I’d hoped, because of weather and sickness. This is the second month in our net worth and spending reports for 2018, and although the market had a small “correction” that did negatively affect our net worth, we are still making progress towards our goals. 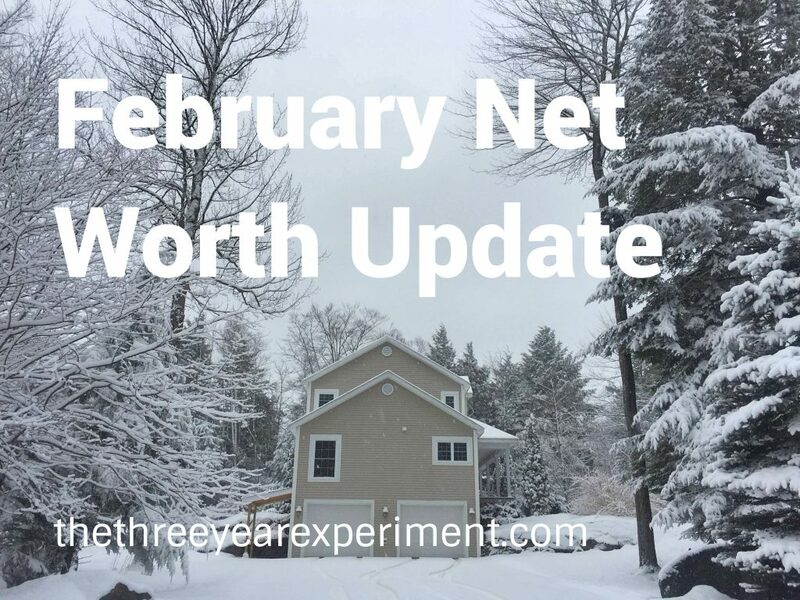 As of February 28th, our net worth has increased by a total of 34.4% from our starting point in December of 2016. In order to hit our goal of doubling our net worth in three years, we’ll need to increase it by an average of 2.77% each month (or 66.66% by this December), but we know that progress won’t be completely linear. We may not quite hit our 66.66% goal for this year, but we hope that the increase in investment income and growth from that will make up for it in Year Three (but if the stock market drops precipitously? Who knows). While it’s a bummer that our net worth decreased, after January’s highs, I am not surprised. We’re still saving and investing our goal amounts each month so I am happy. 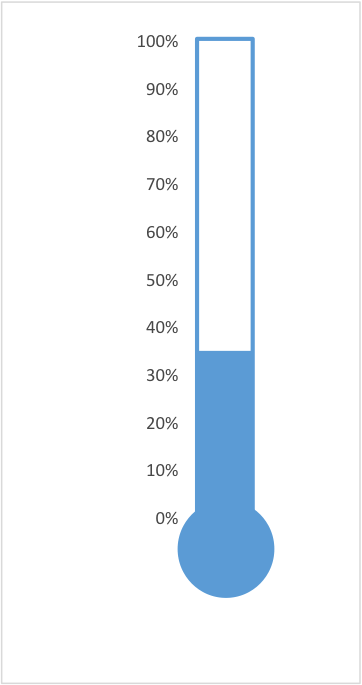 Our net worth progress as of February 28th. We are 34.4% of the way towards doubling our net worth. Auto maintenance: $224.97. We had one local oil change, one emissions test, something Mr. ThreeYear bought at AutoZone (I think a headlight went out), and one crazy expensive oil change from Jiffy Lube. Grrr. Our local mechanic is a lot cheaper. Groceries: $713.51. Month two of our Year of Good Food challenge, where we’re trying to keep grocery spending 20% lower than last year, or less than $772 per month. (We did it for Month 2! Phew!). Eating Out: $42.34. Very pleased with this number. We got takeout pizzas for Mr. ThreeYear’s birthday, a couple of donuts for a special treat, and one lunch at the mountain while skiing. Household goods: $0. Yay. Goose egg, as my fellow blogger Lily likes to say. Kids’ expenses: $220.51. I have finally taken the drum back to school. Junior ThreeYear never played it (never!) and it was such a waste of $20/month. The rest of the expense was paying for lunches and after/before school care (so darn expensive!). Camp: $323.00. Junior ThreeYear is going to an over-night camp this summer and this was the second of three payments. We’ve been excited about this camp for years (lots of local kids go and love it) so I’m hopeful he’ll have a great time. Mr. ThreeYear’s spending: $143.60. Walkin’-around money 🙂 plus a couple of lunches out. Mrs. ThreeYear’s spending: $69.97. My ice fishing course ($55, SOO worth it! ), plus one book before my Lenten no-spend challenge started. 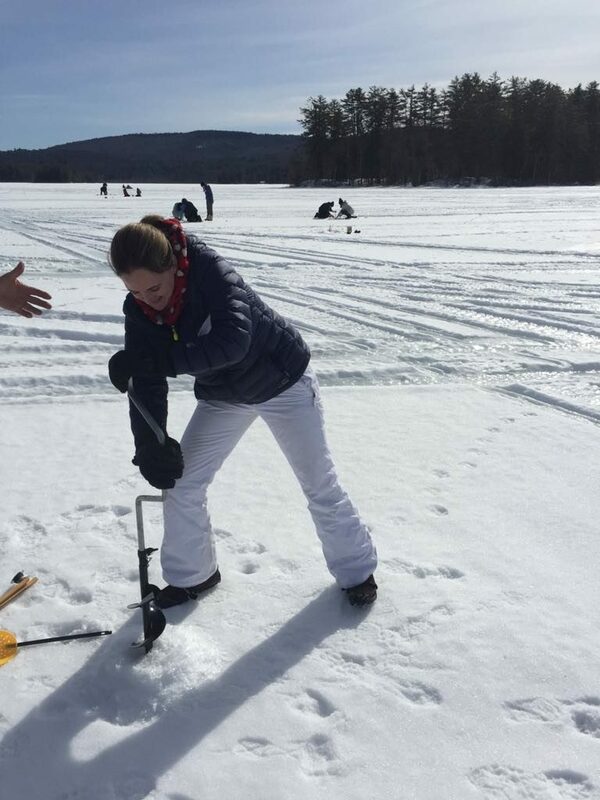 I took an ice fishing course through the New Hampshire “Becoming an Outdoorswoman” program. Had a blast, learned some new skills, augured my own hole, and even caught a fish! Utilities: $324.94. Propane, electricity, internet. It was a high electric bill but we just skirted paying for another propane delivery. We’ve got two big propane bills in a row coming in March and April from deliveries already made. Winter marches on. Clothing: $22.69. We got an awesome bag of hand-me-downs from our neighbors. One of the things we got was a bathrobe for Little ThreeYear. Junior ThreeYear decided he wanted one, too (luckily before the spending ban started) so we ordered this one from Amazon. Haircare: $38.40. We found a cool new barbershop for the boys and they loved it. Fitness: $251.50. Mr. ThreeYear has started to do CrossFit at his pricey gym. (Preventative medicine, preventative medicine!). He did get a check back for $111.50 as an incentive for going to the gym over 12 times, so that made it effectively cheaper. Home Maintenance: $244.26. In addition to our curbside compost pickup, I went to Home Depot and got on Amazon (before the Lenten no-spend challenge) and bought a can of paint, a new kitchen sink faucet, several towel racks, etc., to fix up our house. Housekeeper: $160. Our housekeeper comes twice a month. We could live without her (and we have!) but we really enjoy not deep-cleaning our house. Subscriptions: $29. Netflix, Spotify, Skype. Netflix upped their price! Ouch! Service Fees: $89. Annual fee for our Barclay Arrival Mastercard. This card regularly gives us $800+ cash back in a year, so I’m okay with this yearly fee (which we pay with the cash back $$). Gifts: $85.65. Birthday gifts for my brother and our neighbor. Postage: $16.80. Sent said birthday packages off. Master’s Course: $1732.36: I’m taking my practicum this semester for my Master’s Degree. Almost done paying for these!! YNAB Subscription: $45. Our yearly subscription cost for using the budgeting software YNAB. Vacation: $1900. We bought Disney gift cards to pay for the meal plan portion of our upcoming Disney trip in September. We set this money aside in December and are just using it now. The second number gives us a better number of our actual monthly (controllable) expenses for February, and I feel good about this number, as it’s a good bit lower than what we spent on core expenses last month. This is pretty low core spending for us. The Lenten No-Spend Challenge has definitely helped me not spend $$, and to help me realize that my default is to think, “Where can we go to get entertained?” (especially during Winter Break week with the kids!). But I’ve been forced to be creative and think of places that won’t cost us money, like the library. (Part of our success comes from keeping spending low on our housing and cars, and this year trying to keep it lower in the third big $ category, food). As I type this, we’re getting another winter storm, about 6 inches of snow + sleet mix. Although it’s March, we expect to get a few more snowstorms through this month and next. As always, we’re optimistic for the future and excited to report back for March! Hope you’re starting to get some signs of Spring in your neck of the woods! How was February for your household? There was a NW slump over here too. All around actually! I didn’t know you had YNAB software, do you recommend it? Have a post on it? I want to maybe buy a year for Soapy and guilt her into using it so she’ll be better off. Good eggs are the most fun! ‘Danke’ for the shout out! Doing great there Laurie! We’re also trying to lower our food expenses and have started shopping at Aldi. 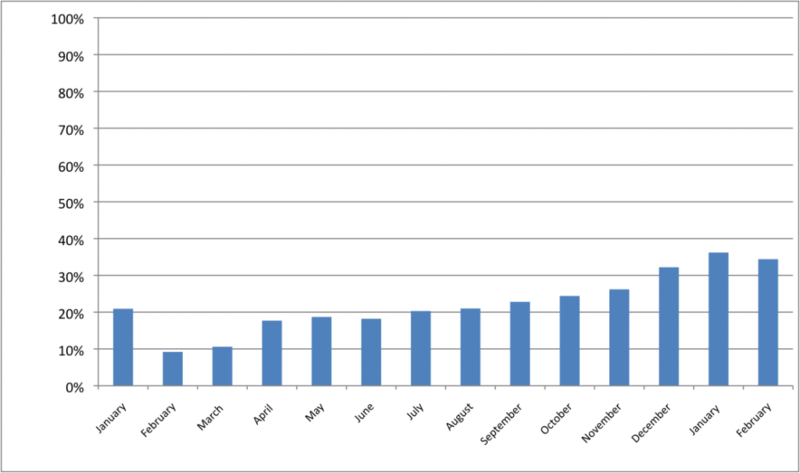 January and February are our tightest spending months, and it’s been compounded by a big medical bill from last December that we had to pay. Looking forward to the end of the oil bills soon! Oh I wish we had an Aldi nearby!! I’m with you on those heating bills. Ugh! For us, almost $400 in propane twice in a row. Hope you get that medical bill paid off soon. I hate the heating bills too. We spend over 5% or our annual expenses on heating! Ugh! You know, I’ve never calculated the percentage of our total spending, but now I’m going to. It really is a huge expense. One thing regarding your credit card annual fee. Frequently if you call the credit card company and say you have been a loyal customer and were wondering if they could waive the annual fee, they will. I read an article about this in the NYT last year and was nervous to try it, but it worked! That’s great advice, Elizabeth!! Thanks. I will have to try it out and see if it works! I’m so happy to have found your blog, Laurie! I’m approaching 37 and your 3 year plan sounds like something that would kick-start my own languishing ambitions. Way to go on the low eating out budget and kudos on the ice fishing course! Thanks for the inspiration!! Thanks so much, Sarah! You can totally do it! Three years has felt long enough to make it feasible but not so long that it feels like forever. I’m a big fan of goals. They’ve helped to make it feel more manageable and broken our big goals down into smaller pieces. Always love these financial updates (it’s the first blog of your’s that i’m reading). I’ve started to annotate down the side of my spreadsheet for my expenditure too. The fishing sounds fun! Can’t beat going out in nature and doing what human’s naturally do. Do you trade or invest in the markets? The ski slope and fishing look like such fun! We are still thinking about our food budget, too. It keeps creeping back up! Thanks! Trying to be a winter sports person, anyway! Yes, I feel like you have to watch the food budget like a hawk to keep it low, amirite?